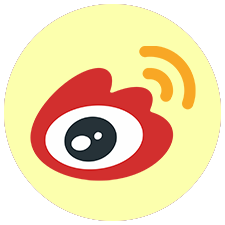 It’s a fun and very active week around here as it’s the Chinese New Year, or Spring Festival. CNY has more than 4,000 years of history and is the longest holiday of the year. 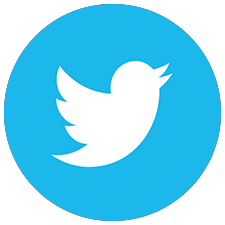 The national holiday begins on February 5th and lasts until the 19th. 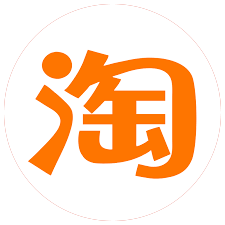 During this time, the world’s largest human migration will take place as hundreds of millions of Chinese people make their way home to celebrate with family. The holiday is also celebrated by millions of people around the world. 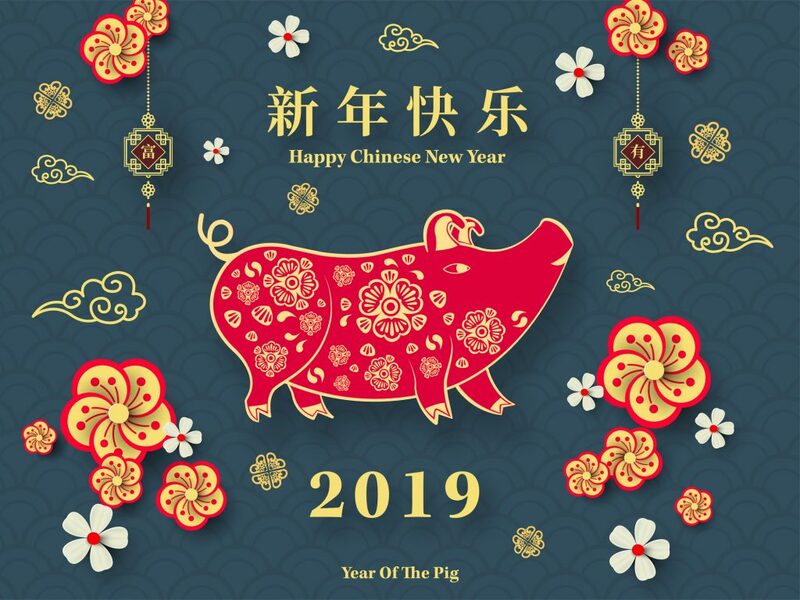 We’re happy that there are so many folks around here to celebrate the season with in this year’s “Year of the Pig”. Gong xi fa cai and Kong hei fat Choi to everyone! Nothing like a great dose of vitamin sea to get you going. 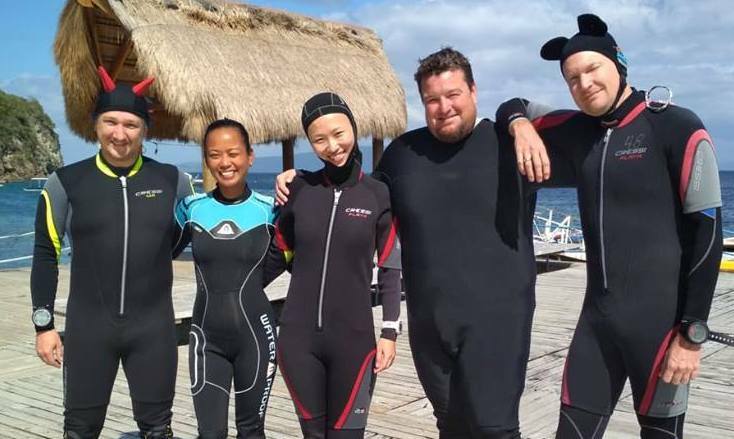 Peter, Maria, Sunny, Sunman and Joakim are looking forward to doing some critter hunting at the Giant Clams dive site. 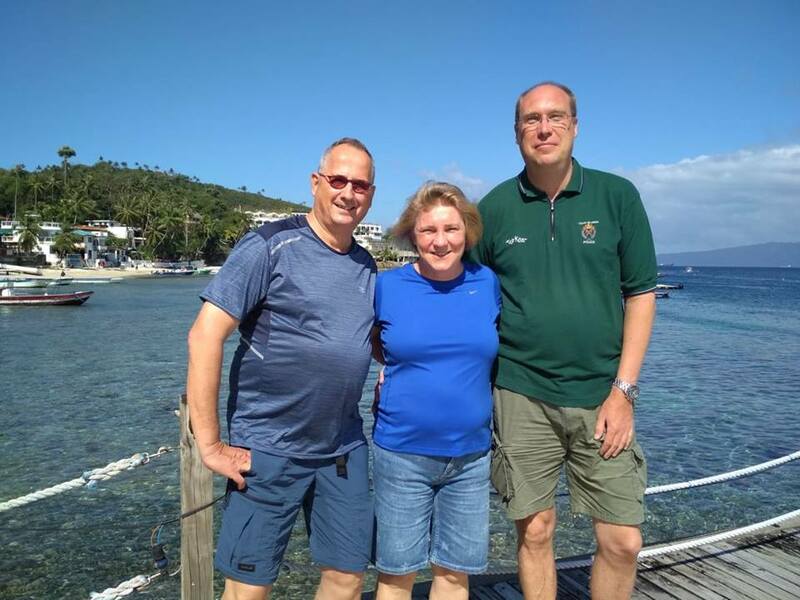 Time has flow by for Martin, Annette and Mikael on their stay here and now after some excellent dives and good fun with everyone it’s time to say bon voyage. 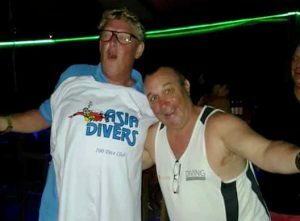 Martin was here for almost one month and happily went home with a new T-shirt for his 500 dives. That’s a lot of time submerged! 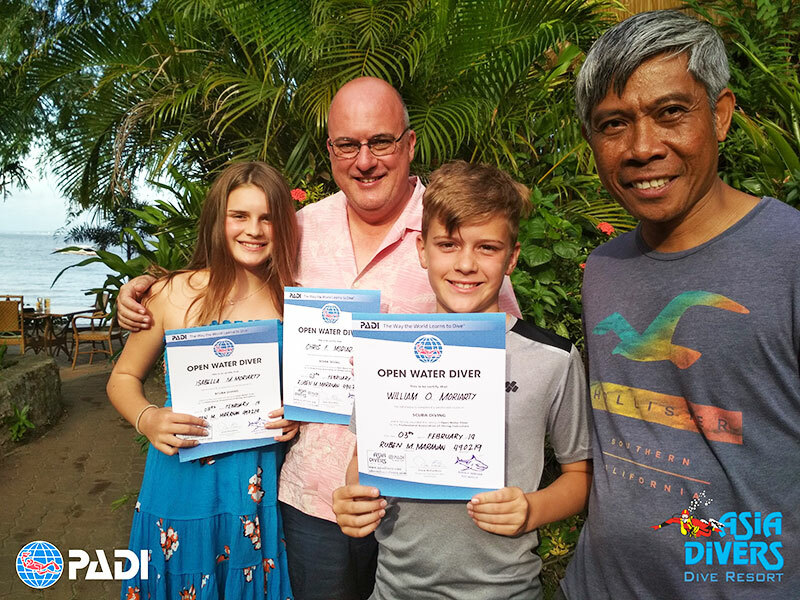 Big congratulations to Bella, Chris and William Moriaty whom are now certified PADI divers! 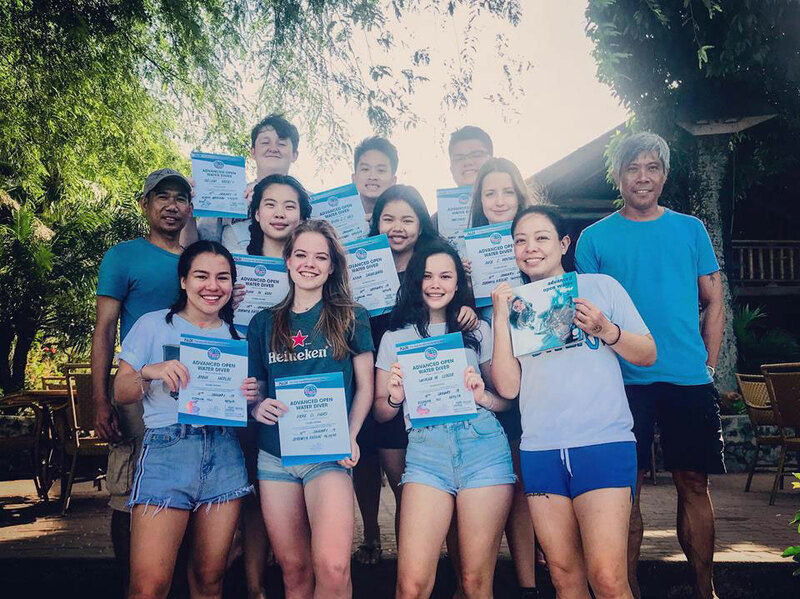 They did the course at a nice relaxed pace over a couple long weekends and even got some time afterwards to do some fun dives. 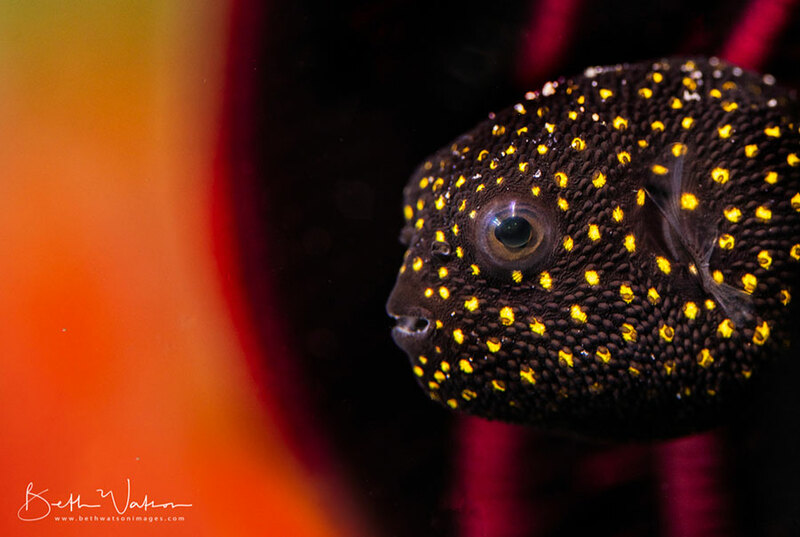 Getting Great Color Underwater ~ The key to getting great color underwater is incorporating artificial light into the scene. Proper strobe placement is vital. Get close to your subject, and then get closer. 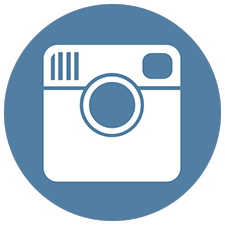 Come and join our Photo Workshop with Phil Rudin and Beth Watson. Instructor Internship is in full swing! 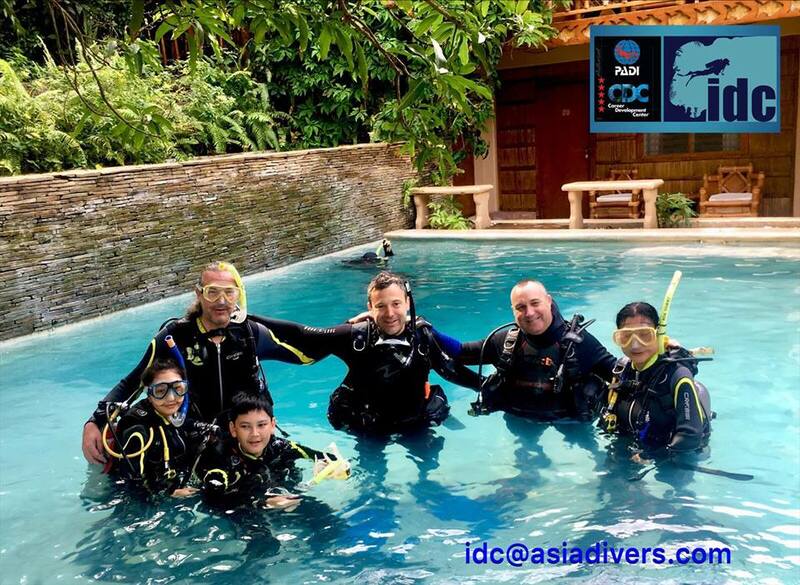 This week is rather busy here at Asia Divers and we are glad to have several of our previous IDC candidates return to help out as well as gaining more experience teaching courses. 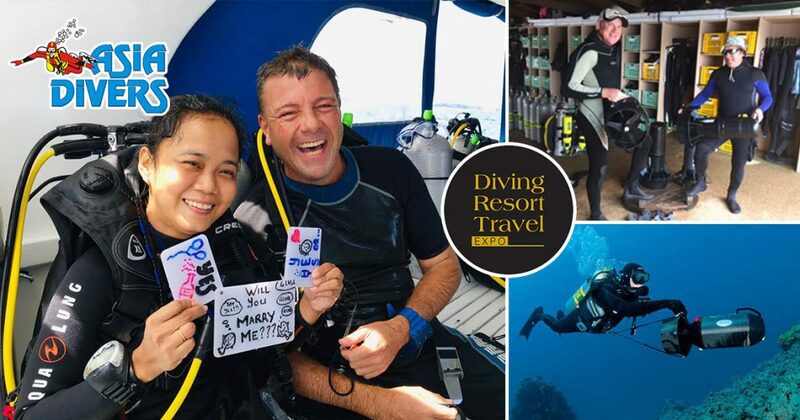 While Alex has been just visiting with friends and family, Matt is guiding dives and Kelly is currently busy teaming up with Pete for an Open Water Diver Course with a family of 4. 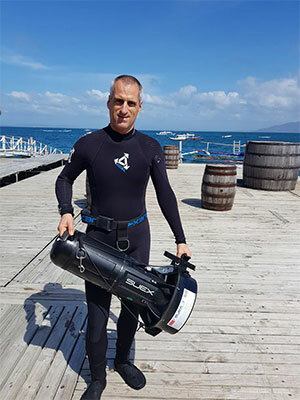 Great opportunity during his instructor internship month to further develop his teaching style and get exposed to many different kind of divers. 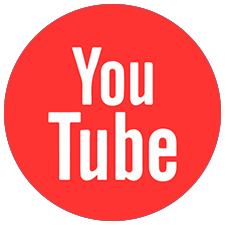 That’s all for this week folks! It was great to have the BIS Ho Chi Minh, Vietnam back here for the 6th year in a row with 17 students and 3 teachers. 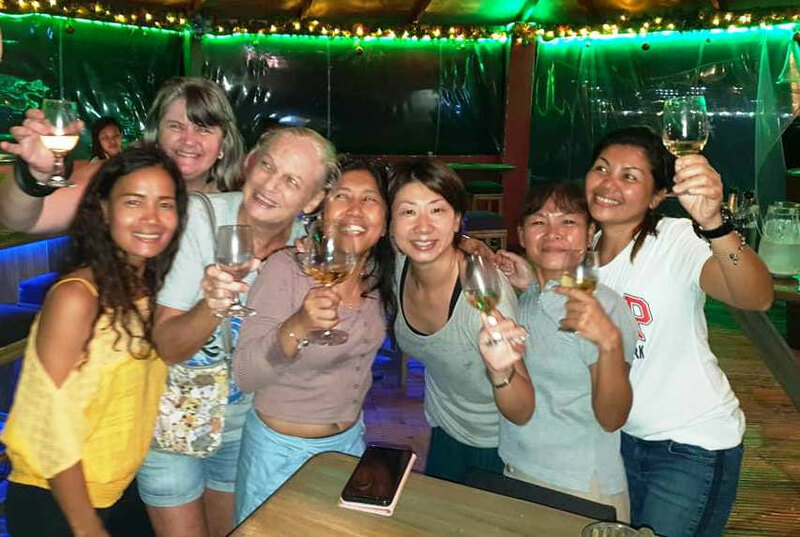 They all had enjoyed the sunny days and kept busy doing diving courses, enjoying the awesome food, card games at night, shopping ops walking past them on the beach and a very nice visit to a local school. 7 students left here as PADI Open Water divers and 9 earned their PADI AOW and one did PADI Rescue/EFR! Everyone worked very hard and should be very proud for what they have accomplished. Even two of the teachers did their Nitrox course this week. 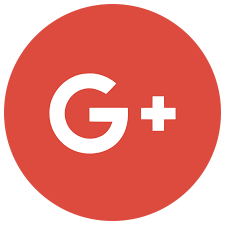 Thanks to Daniel Gamwell who organized everything over the past year to make this happen and to Daniel, Sian and Nathan for keeping things smoothly running while they were here. It sure makes our job easy! 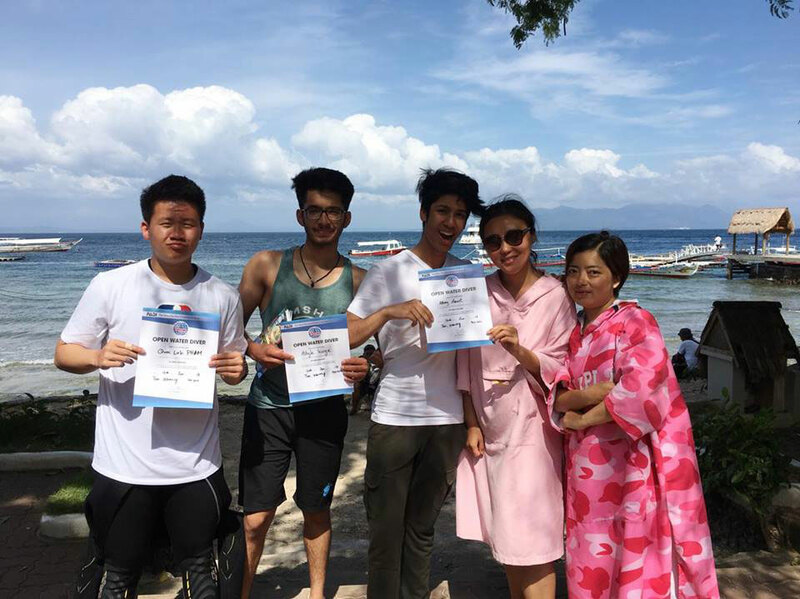 Happy new PADI Open Water divers, Quoc Linh, Ashyle, Abhay with Margaret and Yu. 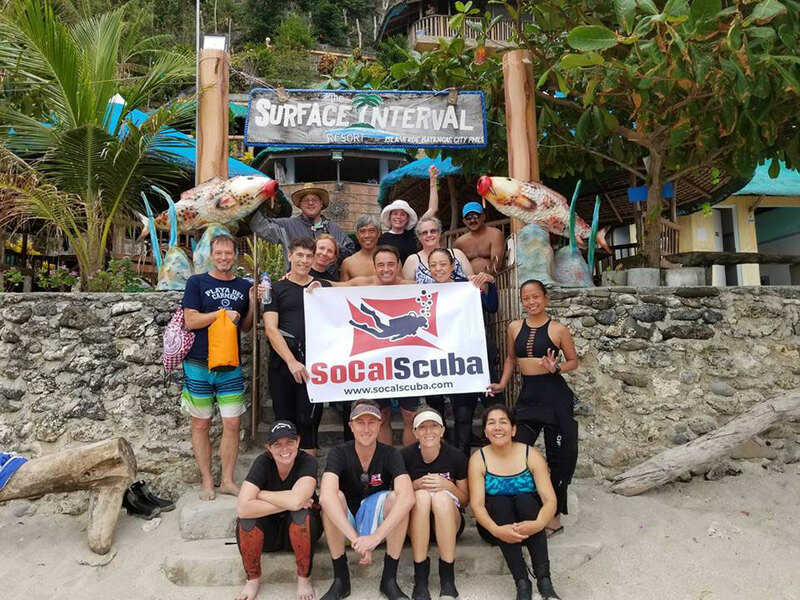 This PADI Advanced group of nine had three instructors (Elly, Jeremy and Ruben) to show them the ropes and lots of cool stuff this week. Congratulations to Anna, Anna, Natasha, Matthew, Bion, William, Fieke, Rose, Christine. 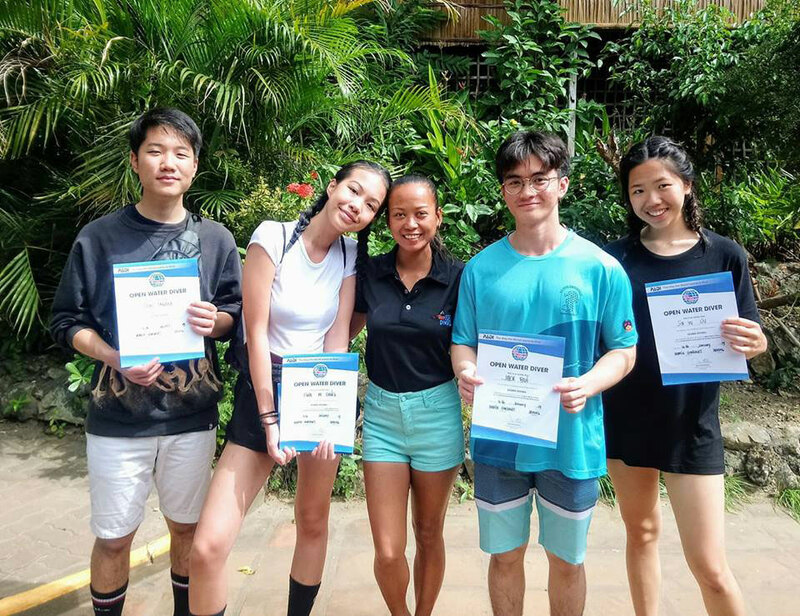 Congrats to Team “Maria” who are all happy new PADI Open Water divers, Yodai, Tina, Jack, and Jia Yu. 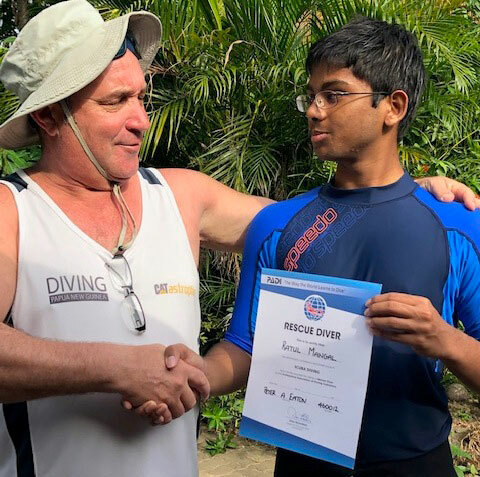 Ratul Mangal moved up the PADI ladder completing his PADI EFR and Rescue courses this week with Pete along with Arthur assisting and being a darn good victim. 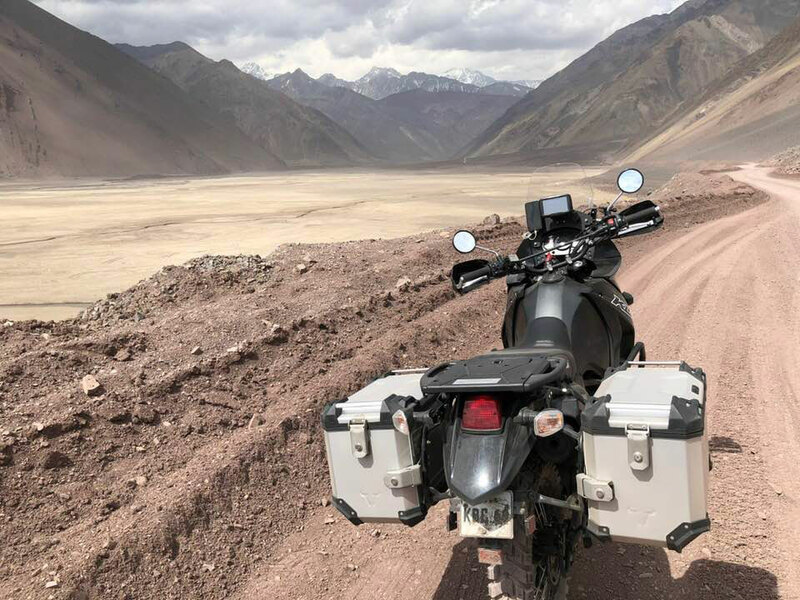 Allan is off on his two month motorcycle adventure around South America. These are the first few scenic photos he has sent us from Chile. We’ll be keeping you up to date on where he is and what he’s up to over the course of this epic trip. 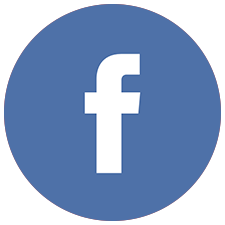 We’re including some funky news polo shirts when you do certain specialty courses with us. 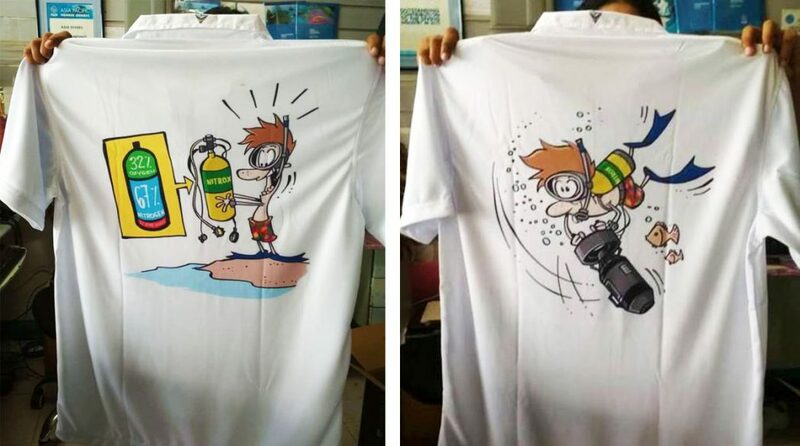 Eventually we’ll have all of them covered but for now we have the polo’s for the PADI Enriched Air course and the Diver Propulsion Vehicle (DPV) course. The “Freddies Specialties” polos are made from high quality material and have some very creative artwork designed by a local artist. 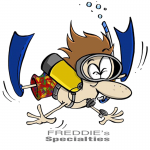 On the front is the small “Freddies Specialties “ logo and on the back is the design for the course . You can also purchase these polos in the dive shop, but the best way to get one is to come here and do the specialties with us! 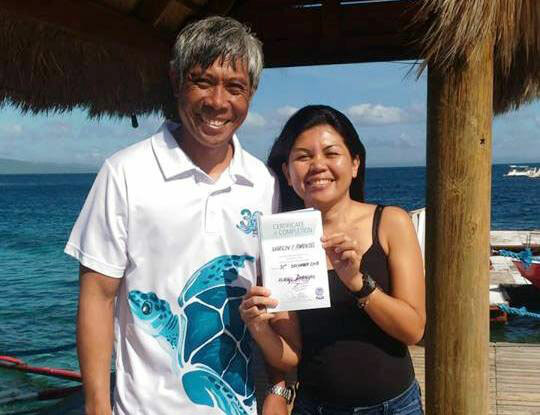 Visit the PADI Specialty Courses page for more info. 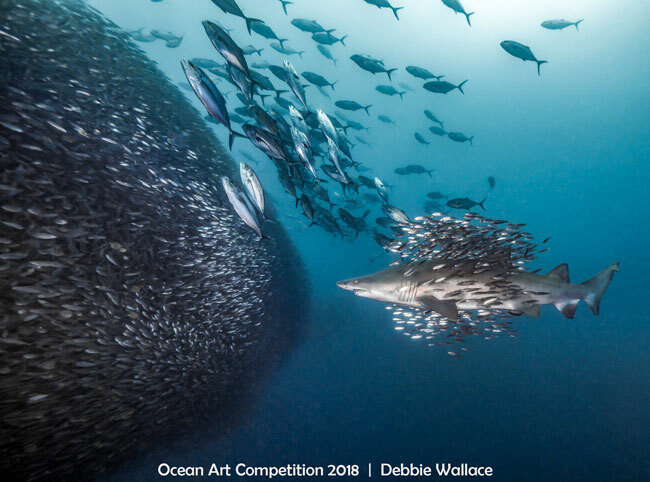 The Ocean Art 2018 winners have been announced! This year’s competition was the most competitive year so far. They had the highest number of entrants and witnessed some of the world’s most beautiful underwater images. 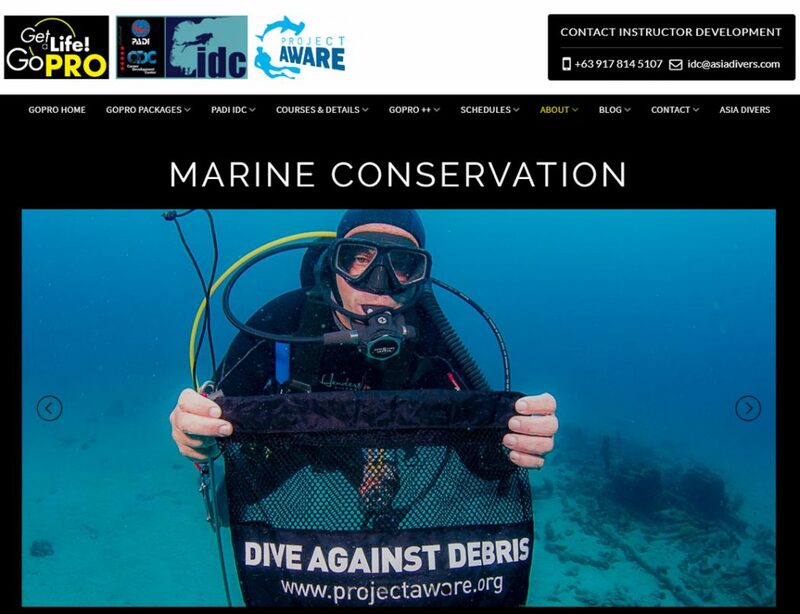 The Ocean Dive Supply website is now finished, including the online store. Now you can sit back onyour sofa to do your scuba equipment shopping, and have it delivered within 3 days to your doorstep via LBC Express. 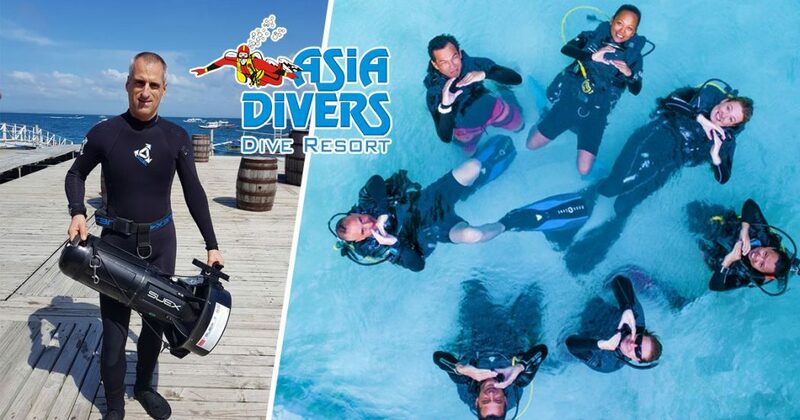 If you are planning to visit Asia Divers, you can check out the products in the online store, let us know what items you would like, and they will be ready for you at the resort! 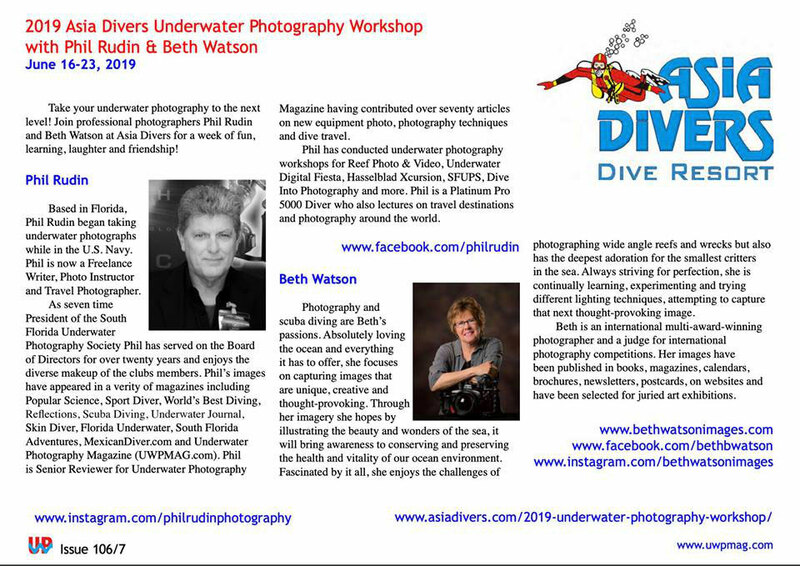 Thanks so much to Peter Rowlands and www.uwpmag.com for including our Underwater Photo Workshop with Phil Rudin and Beth Watson in the latest issue. 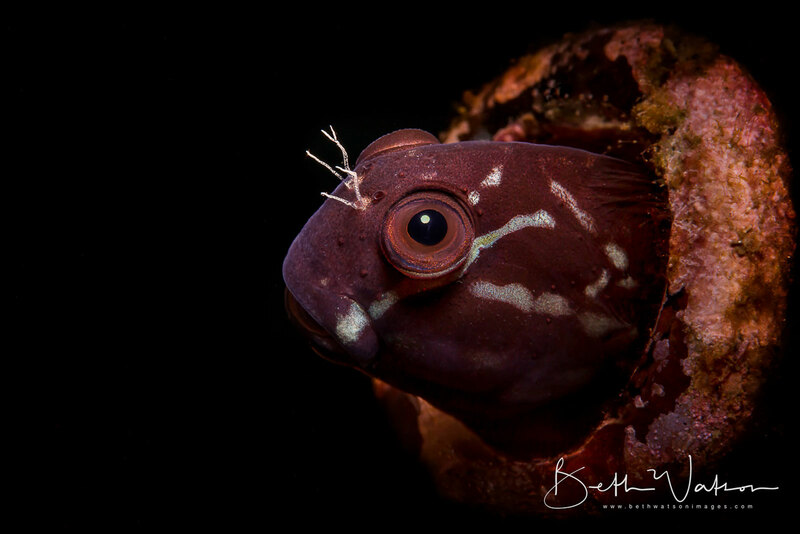 Come and fine tune your underwater photography. 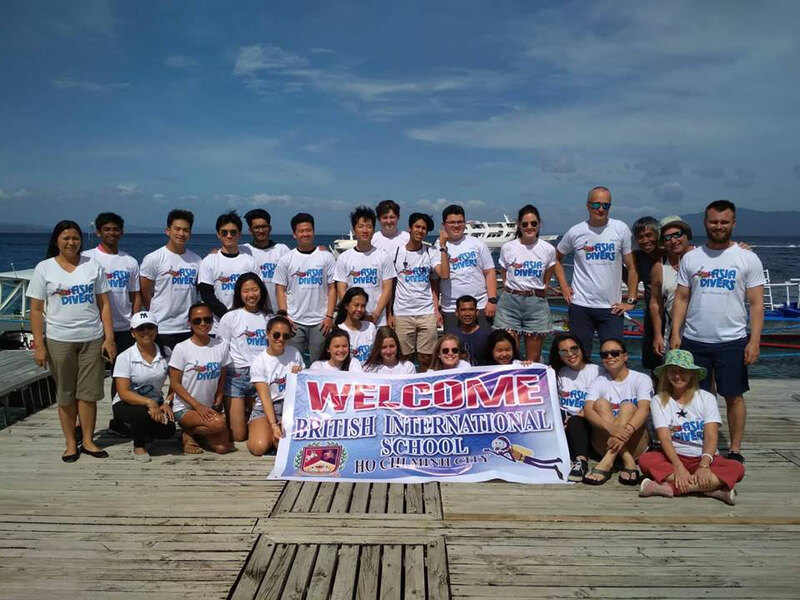 Join our workshop June 16-23, 2019 at El Galleon Resort/ Asia Divers. 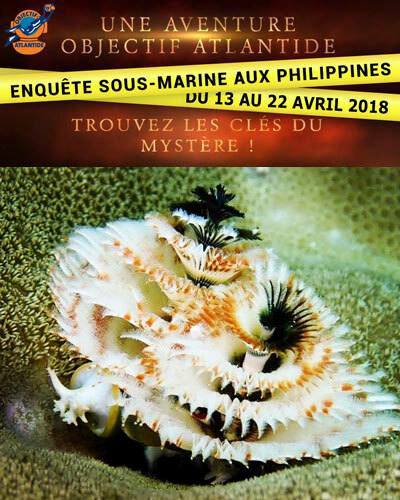 Details about this great event are here: https://asiadivers.com/2019-underwater-photography-workshop/ or send an email to instructors@asiadivers.com for inquiries/bookings. 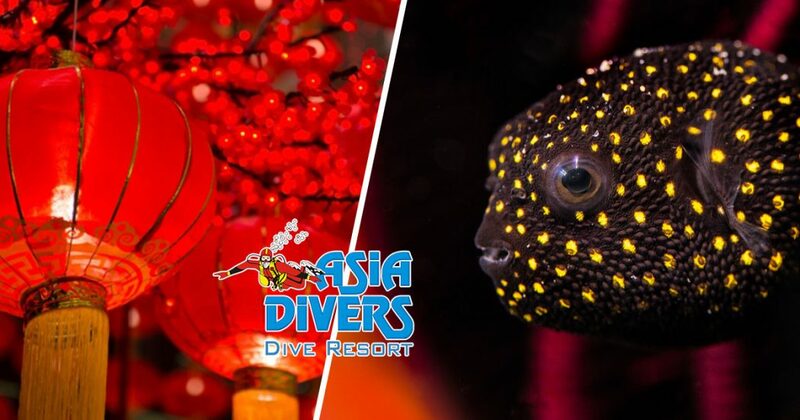 What’s been happening at Asia Divers & El Galleon? January 1st 2019…late afternoon. What a yummy start into the New Year… with good friends, cheese, sausage and wine. 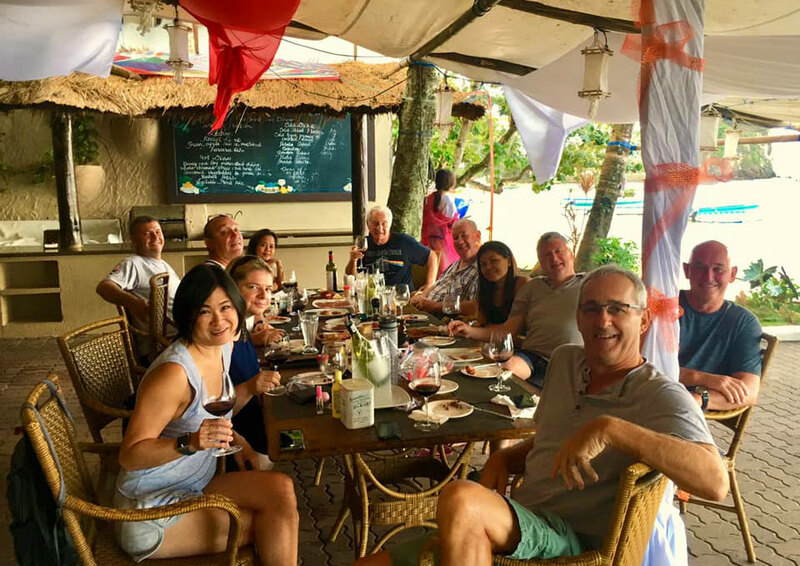 Roberto Giudici had a fun time here this past week dividing his time between Tech Asia and Asia Divers. With his technical and DPV training he is super ready for his next stop… Chuuk. Oh and the bell was ringing! This lot decided to celebrate the New Year for a second time… for most of the evening on the 1st. Many bottles, many rings and a few very sheepish looking ladies the next day. All good fun. 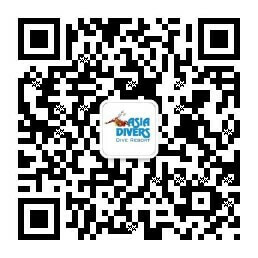 Try Freediving at Asia Divers! 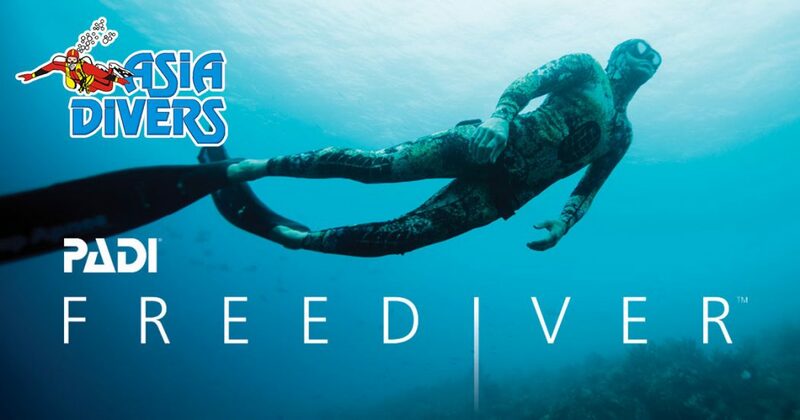 Something new for us at Asia Divers: We’re very excited to announce that we’ll now be teaching the PADI Basic Freediver and the PADI Freediver courses. Freediving is about inward power, discipline and control. If you’ve always wanted to enter the underwater world quietly, on your own terms, staying as long as your breath allows, then freediving is for you. What a great time with SolCalScuba! 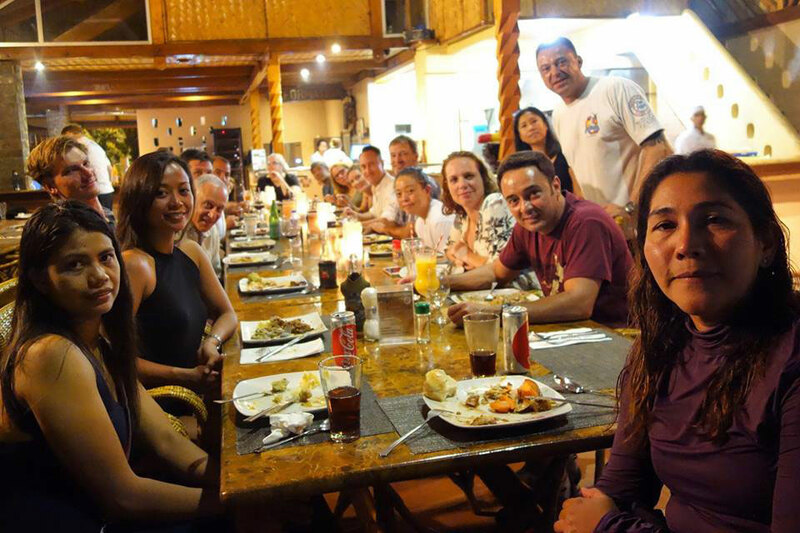 Lots of fantastic dives in our amazing biodiversity in Puerto Galera with a great group of folks. We spent a wonderful evening with the gang from SoCalScuba as we celebrated American Thanksgiving with a scrumptious Turkey dinner and all the trimmings prepared by Chef Jamie and his team. 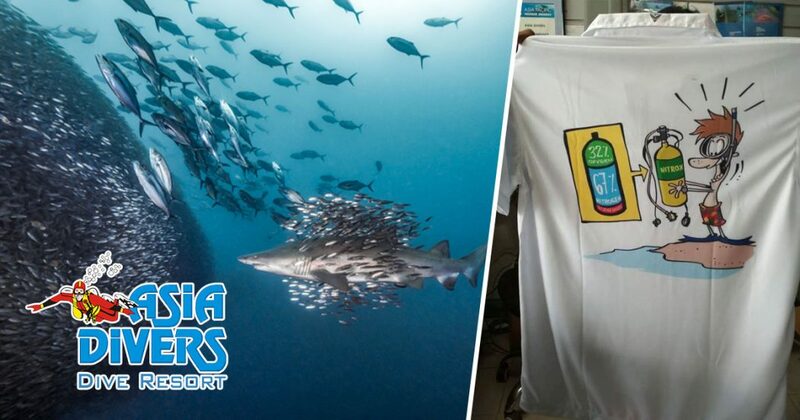 What has our Divemaster Intern, Elliot been up to this week? 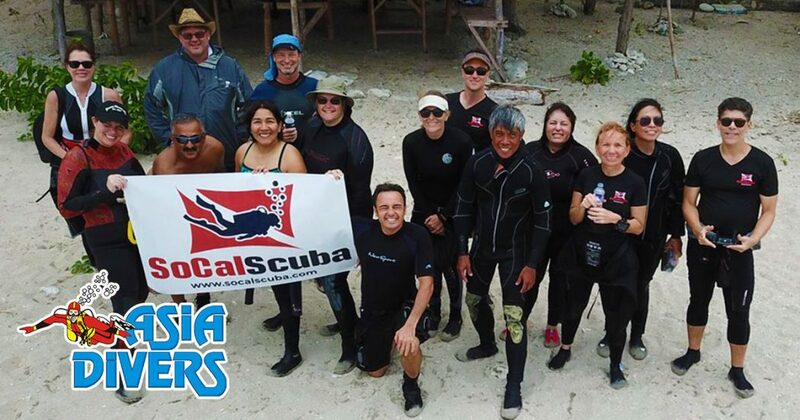 It’s been a busy week with Asia Divers as we enjoyed the company of SoCalScuba from America. 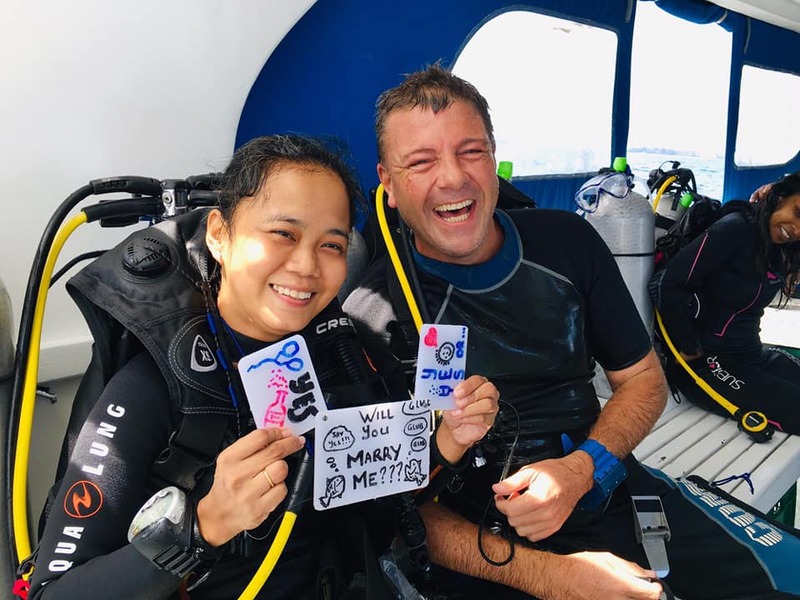 Myself and Elly were paired with the PADI Open Water divers in the group. Along with showing them a great time, we focused on improving their air consumption and buoyancy skills. We were able to show them the best of our fantastic reefs and watch them improve over the week. It was sad to see a great group of people leave but I enjoyed being able to watch my group of divers improve each day. I’ve also had the pleasure of a visit from my own dad, who has been desperate to dive this spectacular coast line and make a special visit to Verdi Island. 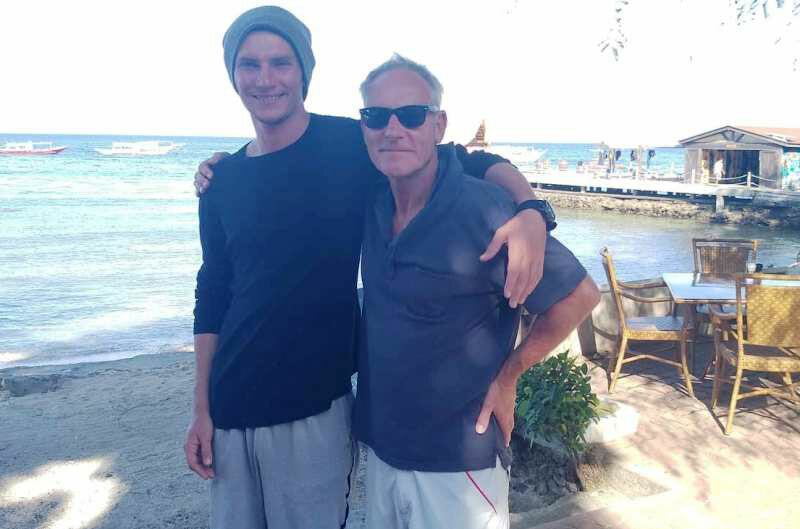 For me to be able to bring him along on the dives and show him why Asia Divers is one of the best dive centres we’ve been to has been very special for us. 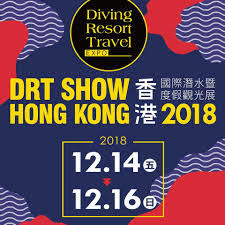 Only two more weeks until I leave Asia Divers now so I’m trying to finish my amazing time here with as many dives and memories as I can. Contact admin@asiadivers.com if you have any questions or would like to make a reservation. 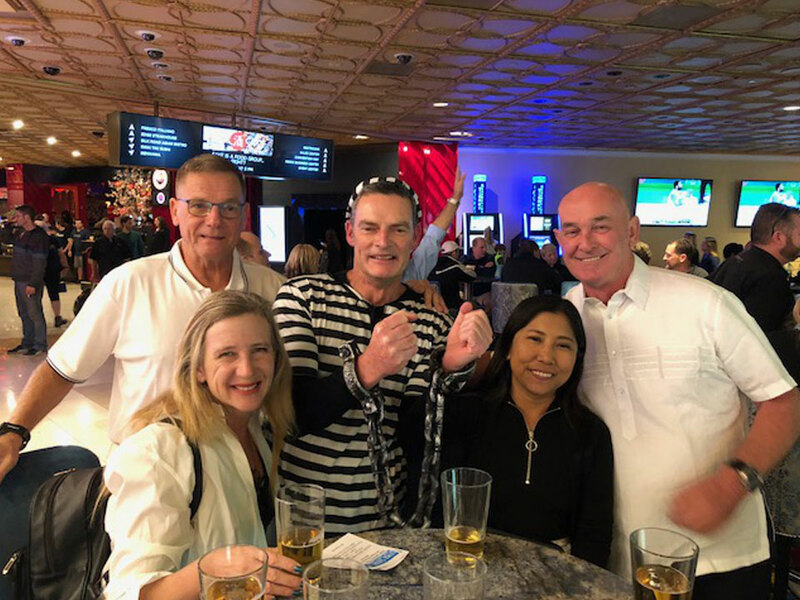 Tommy, Alli, Rhuby, and Allan and our favorite jailbird, Danny Dwyer, from PADI at the Westgate Hotel in Las Vegas having a quick drink before attending the DEMA awards night with the Black and White theme. 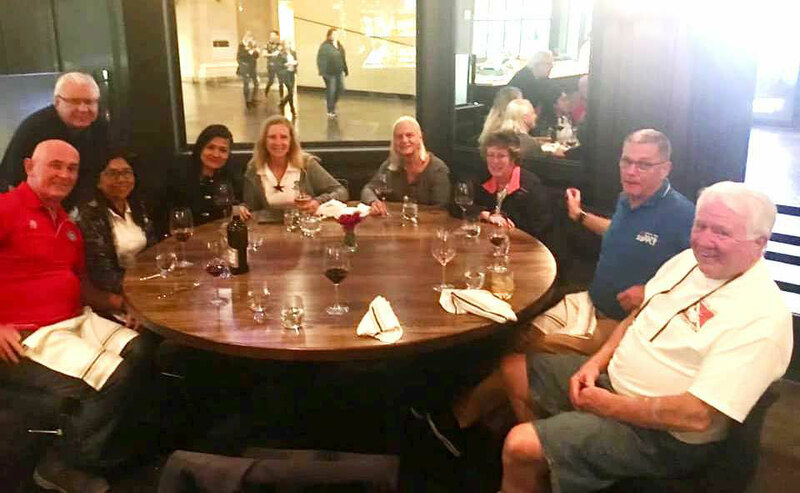 This year’s DEMA was very successful in terms of catching up with our travel agents and business associates from all over the world, but spending time with some of our great friends made it even more special. With John Comerford, Chona Baret, Sue Goodman, Karen and Ray Hopton. John, Ray and Karen used to spend a lot of time here in the early years and we’re an important part of what we have become today…thank you! 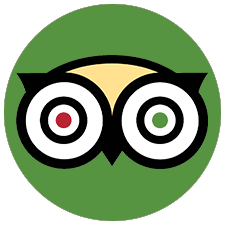 Dive Travel – Dive The Best! 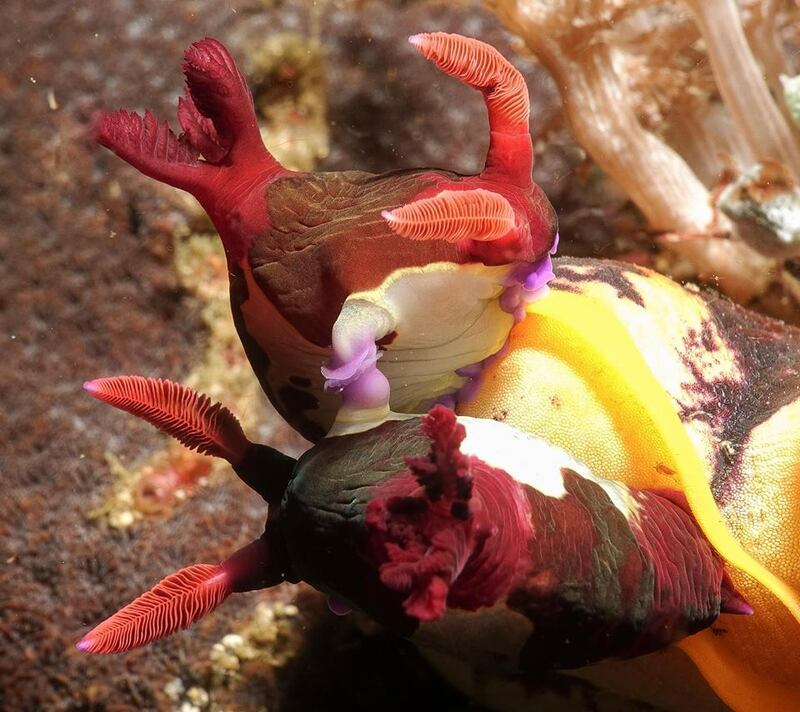 Asia Divers has booked some spots on Discovery Palawan for a 7-day trip to Tubbataha Reefs. 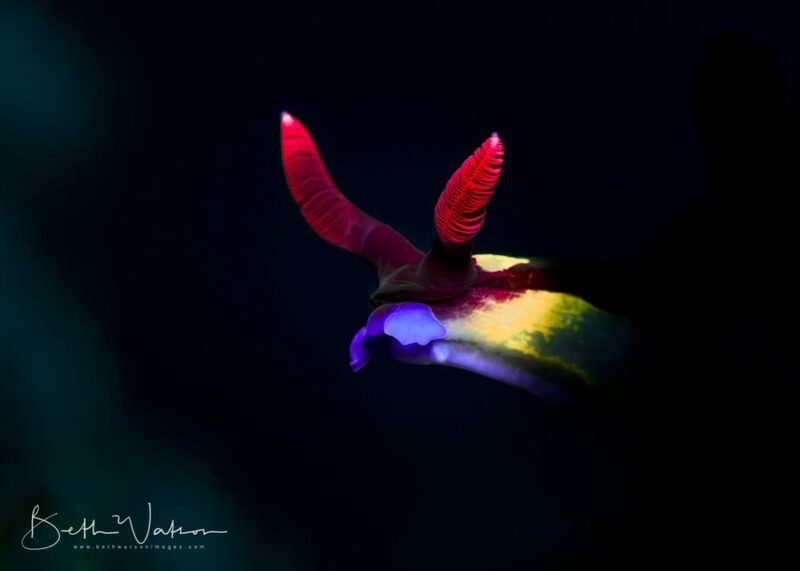 The trip is May 16-22, 2019 with 5 days of diving on South and North Tubbataha Reefs. This is the best diving in the Philippines, don’t think anyone will argue about that. Beautiful walls and reef tops with plenty of corals and of course the pelagics cruising along the wall and out in blue water. In the past trip we have seen plenty of Sharks, Mantas and of course the real highlight, Whalesharks. Contact instructors@asiadivers.com for more details.